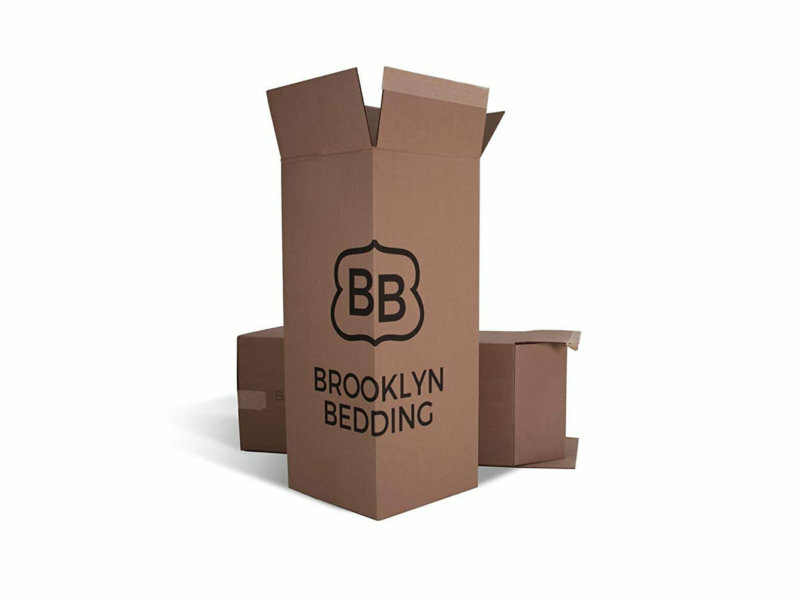 Though by no means the best deal out in the market, Brooklyn Bedding offers the convenience of the bed-in-a-box business model without sacrificing individual creature comforts and preferences. What’s in a Brooklyn Bedding Aurora Mattress? What Can Be Used with the Brooklyn Bedding Aurora Mattress? What’s the Weight Capacity of the Brooklyn Bedding Aurora Mattress? Does Brooklyn Bedding Offer a Sleep Trial, Return Policy and Warranty? How Much Does the Brooklyn Bedding Aurora Mattress Cost? At first glance, Brooklyn Bedding may seem like one of the rising crop of innovative bed-in-a-box e-commerce startups that have appeared in the online landscape in the last few years. The truth: The company has deep roots in the mattress industry, with a somewhat similar story as competitor GhostBed. Who would have thought? Arizona-based Brooklyn Bedding began as R&S Mattress, a mattress liquidation store founded in 1995 by Rob Merwin. At the encouragement of Merwin’s brother John, the company shifted to manufacturing their own products as Brooklyn Bedding in 2000. They put the products up on Amazon years later, then expanded to direct selling on the official Brooklyn Bedding website. In 2015, Brooklyn Bedding purchased a manufacturing facility and hopped on the “one-mattress-fits-all” idea that many of their counterparts were already touting as a selling point. The company is currently run by a staff of over a hundred people, and over a thousand mattresses are shipped daily. This review will focus on the one of their most popular of mattress models: the flagship Brooklyn Signature, formerly called the #BestMattressEver. For a bed-in-a-box product, there’s a lot of customization and comfort to be had with the Brooklyn Signature. This is the case for most Brooklyn Bedding mattresses, but the Brooklyn Signature stands out because it offers customization with a competitive price point. What’s in a Brooklyn Bedding Signature Mattress? The design itself is quite basic: Layers of CertiPUR-US approved foam over pocketed coils, all wrapped in a fire sock, then encased in a mattress cover. It is a mattress built to feel great and work for everyone. The company controls manufacturing—no outsourcing at any point—and has even developed a proprietary latex-like polyfoam to use as a major component of the flagship product. 1 inch of quilted gel memory foam. This part is actually found within the mattress cover, and provides that initial combined feel of cooling and comfort. 2 inches of TitanFlex foam infused with TitaniumGel. Made of patented and trademarked material that we’ll discuss in detail later on, this layer provides responsiveness, but also good contour without a feeling of excess sinkage. Motion and heat transfer are minimized and managed well. 2 inches of firmer TitanFlex foam. Why firmer? The purpose of this foam layer is mainly to provide a smooth transition from the upper layers cradling your body to the pocketed coil system underneath it. 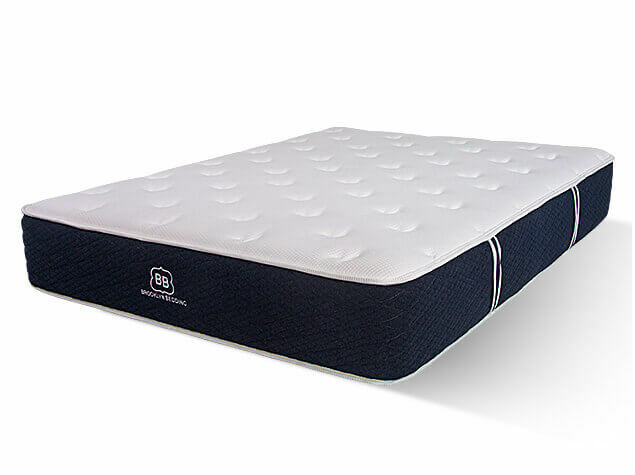 The firmness also provides some deep compression support and increases the durability of the mattress core. 6-inch pocketed coil system layer. Brooklyn Bedding calls them “Ascension” coils, but they are essentially individually sleeved springs that together act as the base design of the entire mattress. The system allows for maximum reactivity and comfort. It also provides great motion isolation. 1 inch of high density polyfoam. The support foam is like any situated in this area in a mattress. The bottom layer supports everything above it, and reinforces the structural integrity and durability of the mattress design. The layers are stacked and reinforced by a snug flame retardant sock made of a non-woven fabric blend of cotton, polyester, rayon, and silica. The entire thing is then encased in a breathable cotton and polyester blend-based mattress cover that is quilted in-house. Side panels are a solid blue and include carrying handles—a feature we very much appreciate. The responsive polyfoam is a latex alternative that is designed to offer superior bounce, breathability, comfort, cooling, pressure relief, and support. It’s eco-friendly, more durable than latex, and better at wicking away and dissipating heat and moisture. Brooklyn Bedding likely makes TitanFlex foam in different densities for different mattress interior uses. There was also some mention of TitaniumGel that’s used with it, which we believe is similar in function to the cooling gel used in gel memory foams. Can You Customize the Brooklyn Bedding Signature Mattress? Most definitely. The Brooklyn Signature is made in twin, twin XL, full, queen, king and California king sizes. It also comes in soft, medium or firm comfort levels. Soft is best for side sleepers. It provides extreme pressure relief and the most contour and hug. Medium is best for compromise. Are you an active sleeper that changes sleeping positions throughout the night? Are you sharing the bed with someone that has a different comfort level preference? This level is ideal for people meeting in the middle. Firm is best for back or stomach sleepers. It provides a flatter and more solid sleeping surface, as well as extra lumbar support. Yes, the Brooklyn Signature is the most popular; but similar to other companies that started with a “one mattress fits all” approach, Brooklyn Bedding has since diversified. If you’re on a tight budget, consider the more affordable, all-foam Brooklyn Bowery mattress. 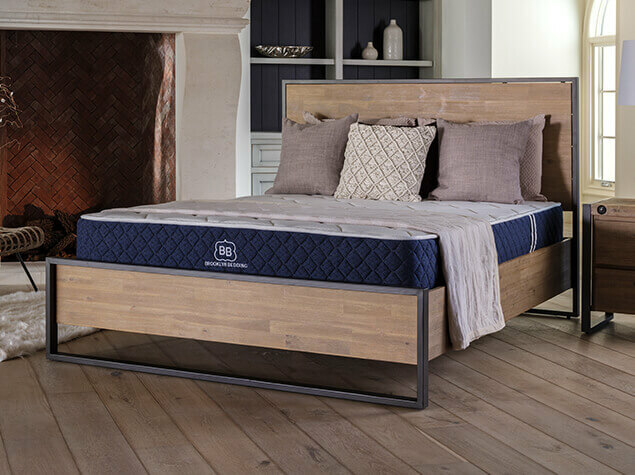 If you’re willing to splurge for premium comfort and design, consider their innovative Brooklyn Aurora mattress. Each mattress, regardless of comfort level, is 11.5 inches thick and in general heavier than industry counterparts. For example, the queen Brooklyn Signature is 115lb—most top off at 70lb-80lb. 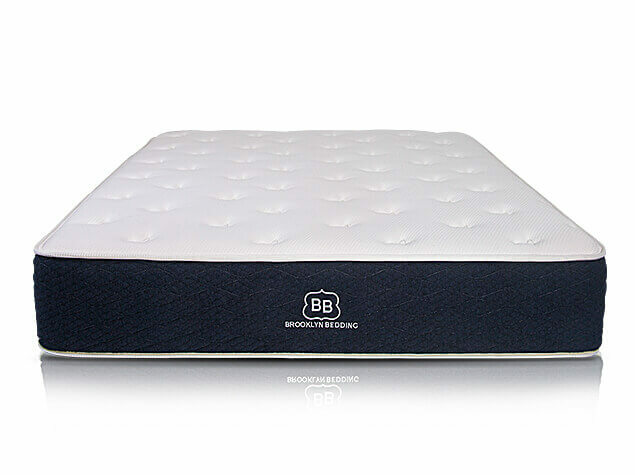 The weight of the mattress would have affected our rating of this product, but Brooklyn Bedding includes side handles on the mattress cover, which makes the product easier to move. Great thinking on their part! What Can Be Used with the Brooklyn Bedding Signature Mattress? The warranty the Brooklyn Signature comes with clearly states that the product must benefit from the continuous and solid support of a proper foundation with little to no give. Frames with slatted wood or metal should have slats four inches apart at most.Using improper bases, like old box springs or platforms with slats too far apart, will void the mattress warranty. How Do You Set Up the Brooklyn Bedding Signature Mattress? Brooklyn Bedding’s flagship mattress is easily unboxed and prepared for use. You can keep the product in the box three weeks after you receive it, but it’s best to open the package sooner rather than later. Like all new mattresses that you can buy online, all you need to do is take the heavily compressed and rolled up product out of the box, place it top and in front of your bed frame, and carefully unwrap the plastic protecting it. As the mattress is freed from its packaging, it should start to expand to its full size. If you notice a “new mattress smell“, air it out in a well-ventilated room until the odor dissipates. Off-gassing shouldn’t be a huge problem as Brooklyn Bedding doesn’t use chemical fire retardants. The mattress cover is not easily washable, and the company recommends spot cleaning only. If you’re anticipating a lot of staining and spillage, it’s best to invest in a washable mattress protector. What’s the Weight Capacity of the Brooklyn Bedding Signature Mattress? It must also be noted that the materials used in the succeeding update of the mattress—compared to the original #BestMattressEver—are quite dense. The mattress design now seems to be specifically engineered to be more resilient and durable than the high quality latex-based one the Brooklyn Bedding flagship product launched with. How Does the Brooklyn Bedding Signature Mattress Feel? Several reviews online—both from actual customers and professional reviewers—have noted the superior quality of TitanFlex compared to latex. There is a noticeable difference. Heat, moisture and motion are all absorbed well, leading to proper dissipation. Though body contour is present, there is no overt sinkage—no “quicksand” feeling of the mattress swallowing you up. There is a bounce to the material, too—but not with the typical excessive firmness that quality comes with, especially when compared to older, more traditional innerspring mattresses. Overall this is a difficult question to navigate, as the Brooklyn Signature comes in three comfort levels. Even verified customer reviews will reflect wildly different experiences due to customization. Many e-commerce mattress startups handle the development and direct sales of their products internally, but still outsource the actual manufacturing process—not Brooklyn Bedding. They are involved in everything, from mattress design to the creation of a proprietary raw material. The mattress covers are even quilted at the same factory where the mattresses are made. This attention to detail and minimization of steps lead to a more efficient assembly line; and mattresses that are top quality, offered at a very competitive price point. We initially had qualms about the constant changes in their mattress designs and offerings: from one to three to now six kinds of mattresses; from previously offering nine sizes to now just offering the six US standard sizes; from latex and polyfoam to using patented TitanFlex and other materials in other mattress models. But if this is because of a constant drive to improve and be better, that says a lot about the company’s promise and potential. How Is Brooklyn Bedding’s Customer Support? Brooklyn Bedding’s official website is informative enough but the FAQ is lacking in some details. While that can be frustrating, customer support thankfully fills in the gaps. There is live chat support and a contact form on their website, as well as a provided telephone hotline. Yes, yes and yes—but not all the time. What? Let us explain. Brooklyn Bedding includes a full 10-year mattress warranty. Make sure to ask customer support for advice on your bed setup, though. Find a base, frame or platform that you can afford and won’t void Brooklyn Bedding’s very strict warranty conditions. The 120-night sleep trial is generous, but it’s also not 100% reliable and headache-free. There’s a 30-day interval in the beginning where you can’t activate the return policy because it’s considered a “break-in period”. Also: The sleep trial won’t apply if you purchase the Brooklyn Signature anywhere that’s not the official Brooklyn Bedding online store. For example: If you purchase on Amazon, you will only be covered by the retailer’s 30-day return policy, and that’s it. How Much Does the Brooklyn Bedding Signature Mattress Cost? As of this writing, the medium queen-sized Brooklyn Signature is available $699.96 on Amazon. Much more affordable than it is on the official brand website. Purchased directly from Brooklyn Bedding, the same mattress is listed at $949, plus any needed shipping fees depending on your location. You can also choose to avail of an Affirm payment plan. The 120-night sleep trial when you go this route, too. Visit Amazon & Find Brooklyn Signature Mattress Deals Now! Many new mattresses feature proprietary material, but the startups that use them as a selling point usually come out with it included in their initial product. Brooklyn Bedding started in the bed-in-the-box market with a hybrid foam mattress consisting of latex and polyfoam—and it was doing well. That they went the extra mile and continued to improve on their own design says volumes about their commitment to deliver a product that truly lives up to its name. It’s a shame that the mattress cover isn’t easily washable, and that shipping costs aren’t refundable; but those are limitations that aren’t unique to Brooklyn Bedding. We are a little surprised that the price went up this much, too! The original #BestMattressEver cost $200 less than what it’s retailing for now. Because Brooklyn Bedding updates their mattress design from time to time, any review or write-up—even this one—may not be completely reliable, depending on when you come across it. One thing is for sure, though: Though by no means the best deal out in the market, Brooklyn Bedding offers the convenience of the bed-in-a-box business model without sacrificing individual creature comforts and preferences.